From 1921 to 1939, when Kearsney College was situated amongst the tea plantations of the North Coast, the school had too few boys to field sides against the major schools. The school masters consequently used to join the boys and the team would play against men’s teams from Stanger, Empangeni, Eshowe and Melmoth, competing for the Webber Cup. 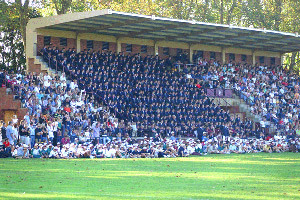 In 1939 Kearsney College relocated to Botha’s Hill, halfway between Pietermaritzburg and Durban. This move proved to be the turning point in the School’s rugby fortunes, providing as it did a larger intake of boys and the opportunity to play against more school teams. One of the most fascinating chapters in the history of Natal Schools’ rugby is the story of the “Old Crocks” and their traditional game against Kearsney. 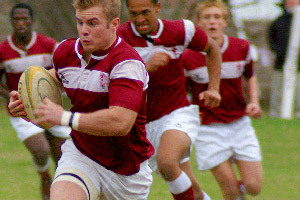 Situated at the time near Stanger on the North Coast, the Kearsney boys had little contact with other schools and little opportunity to play or watch quality rugby. In response to this situation, in 1931 Cyril Medworth, together with former Springboks Alf Walker, Wally Clarkson, Bill Zeller and Bill Payn, colleagues of his in the Natal side, gathered together a team comprised of six former Internationals and nine ex-Natal rugby players to play against the School. Thus began an annual tradition which has continued uninterrupted for a period of 80 years. During this time, only some 500 players have represented the “Old Crocks” – quite remarkable when one considers that one of the qualifications for membership is that the player must have retired from competitive rugby. Bill Payn served Natal Schools’ Rugby, including as coach and later Chairman, for 18 years. In recognition of his contribution to rugby, the “Old Crocks” Trophy was renamed the “Bill Payn Trophy”, manufactured under Alf Walker’s direction from two 2lb Illovo Syrup tins on a wooden plinth. This trophy is still displayed on “Old Crocks” Day at the College. The various Old Crocks teams have included thirty five ex-Springboks, five of whom were captains, twenty four former Natal captains, and three English, Irish and Australian internationals. After 81 unbroken years, the final whistle was blown on the historic annual Old Crocks rugby match, played between former Springbok and provincial players and the Kearsney College 1st XV. New SA Rugby Board legislation prohibits matches between players of different age groups, in an effort to reduce injuries in the game.